We’re now living in a world where we’re more aware of how important sleep is for our day to day lives which has led to improvements in how we approach our sleeping routine. Weighted blankets have entered the market with their popularity also backed by scientific data. 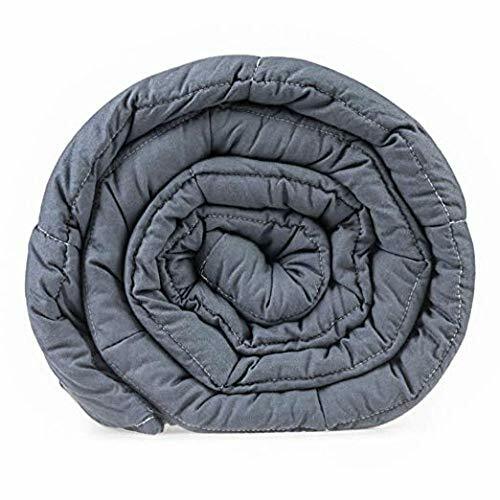 A weighted blanket is exactly what it sounds like; a blanket that has more weight to it than an average blanket because the inside is evenly lined with pellets or beads. This idea has been used for years in the medical field to induce calmness in hyperactive children, but this is now moving into the mainstream market. The weighted blanket essentially feels like a full body hug which can help to reduce the effects of a range of disorders including stress, anxiety and insomnia making it easier to fall asleep. Gravity is one of the leaders in the weighted blanket market and delivers a premium product worldwide. This blanket provides a lovely comfortable sleep even weight distribution that stimulates the deep receptors within the body. This induces relaxation giving you higher quality sleep. The blanket itself is handmade using 100% certified Oeko Tex Standard organic cotton that is grown in Spain. The gravity blanket is sewn into square pockets which are filled with hypoallergenic glass micro-beads that don’t cause any discomfort. The weighted blanket is also supplied with a velour cover. You have a choice of weight from 4kg up to 12kg, and when you use it, you’ll feel a warm embrace that feels similar to a hug. 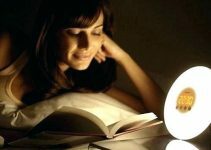 This makes it easier to fall asleep due to reduced anxiety and stress. It’s no surprise that Gravity Blankets are leading the industry because this is a truly premium product. The Buzio weighted blanket comes in 7 different sizes so you’ll have no issues in choosing one that fits into the recommendation of being around 10% of your total body weight. The blanket has a weighted inner layer that’s constructed from 100% high-quality cotton while the filling is hypoallergenic and durable. The cotton material is breathable to help regulate your body temperature throughout the night. There are also two polyester layers that protect the inner beads from tearing or leaking. Although the filling is sand-size pellets, collectively they work together to provide an expertly weighted blanket. The blanket also has gridded stitching to ensure that the internal beads remain evenly distributed. The weighted inner layer is machine washable making maintenance a breeze! Also supplied is a 12-month warranty giving you the extra peace of mind before deciding to buy. Senso-rex has created a weighted thermal blanket that aims to improve the quality of your sleep. Each blanket is filled with ecological and glass balls that have a diameter of 0.9 - 1.1 mm and are designed not to penetrate or damage the outer layer. You have a choice of 5 different weight sizes and has helped countless people improve how they sleep ensuring that they wake up in the morning feeling more energetic leading to a more productive day. The blanket is manufactured right here in the EU highlighting it’s high quality and if you’re not sure of your desired weight, you can always purchase it to test and return for an exchange within 30 days of your order date. It gives you the flexibility to ensure that you end up with the best weight. Weighted blankets deliver a feeling referred to as ‘grounding’ where the blanket applies moderate pressure to the user's body which makes you sink further into the mattress surface. This grounding increases the release of calming hormones which helps you fall asleep quicker. The pressure triggers the parasympathetic nervous system that reduces your stress response making you feel more relaxed. The feeling given by the blanket is also known as deep touch pressure stimulation where the pressure delivered by the blanket targets the necessary vital pressure points that induce calmness similar to a high-quality message. It gives you a sense of well being and peace, so you fall into a deeper and more restful sleep. Under the age of 8: Because of the blankets weight, it could be potentially dangerous for children below 8. So, if it’s going to be used it needs to be agreed with a medical professional. A weighted blanket will naturally retain more heat than an average blanket which means that those that suffer from hot flashes may have more hot flash episodes. If you suffer from cardiovascular problems such as reduced blood flow, then this can be worsened with the use of weighted blanket because the added weight may affect the rate that your blood is pumped around certain areas of your body. A weighted blanket weighs more than a traditional blanket which could make people living with Claustrophobia feel trapped and extremely uncomfortable depending on the blanket weight that they’ve chosen. Although weighted blankets have the most significant effect on those who currently suffer from specific sleep disorders, even if you don’t they can still be used to enhance your sleep. The act of grounding suppresses the production of Cortisol which is a hormone which is sparked by stressful environments. Cortisol, in general, isn’t a bad thing, but at night this can interfere with the release of the sleep hormone Melatonin resulting in a poorer than usual sleep. The reducing of cortisol due to grounding was investigated in a 2004 study which involved 12 subjects who complained of problems with stress and lack of sleep. These 12 subjects were then instructed to use a grounding blanket for eight weeks in their beds before the study commencing saliva tests were conducted to obtain baseline cortisol levels. Cortisol testing was repeated at the 6-week mark and results showed that cortisol levels were significantly lower throughout nighttime sleep. Subjects also reported that their initial sleep deprivation and stress levels had either reduced or been eliminated throughout the treatment allowing them to experience higher quality sleep. Melatonin is a hormone that is released when our body is ready for bed and gives you the feeling of being tired. Those that have insomnia have a problem of not producing enough melatonin which is why they have trouble sleeping. Weighted blankets reduce the effects of insomnia meaning that more Melatonin is produced leading to higher quality sleep. The use of a weighted grounding blanket leads to the release of dopamine, serotonin and other chemicals that are referred to as ‘happy hormones’. These hormones have a calming effect which helps you to relax and fall to sleep. The effects of the weighted blanket mean that you will have a lower sleep latency which is the amount of time it takes to get to sleep. If getting to sleep has been a problem for you then you’ll be able to get more hours of sleep per night, while the quality will also be higher due to being induced into a deeper sleep state. Due to the weighted blanket placing you in a deeper sleep it means that you’re less likely to be disturbed by external noise or light sources. The fewer interruptions you have throughout the night, the more rested and rejuvenated you’ll feel in the morning. An extreme effect of not getting sufficient sleep each night is sleepwalking. Weighted blankets relax you more than traditional duvets or blankets which puts you in a deeper state of sleep. It makes weighted blankets an effective tool for sleepwalkers. The weighted blanket you choose may depend on the fill material that you desire. Most weighted blankets have a filling of either plastic, glass, or steel beads which are evenly spread throughout the blanket to ensure there’s an even distribution. These fillings are usually silent to ensure that your sleep isn’t disrupted. So if you have a personal preference for the filling that’s used, then this is something to consider. Different people like different sized blankets. Some people prefer a blanket that they can wrap their whole body in, whereas others prefer it to drape over just a part of their body loosely. Most weighted blankets link their weight and size together so the heavier the blanket, the larger it usually is in size. Your budget will affect the weighted blanket that you can afford to buy. Weighted blankets are typically significantly more than the average duvet with prices usually coming in above £100 because of the added benefits they bring. 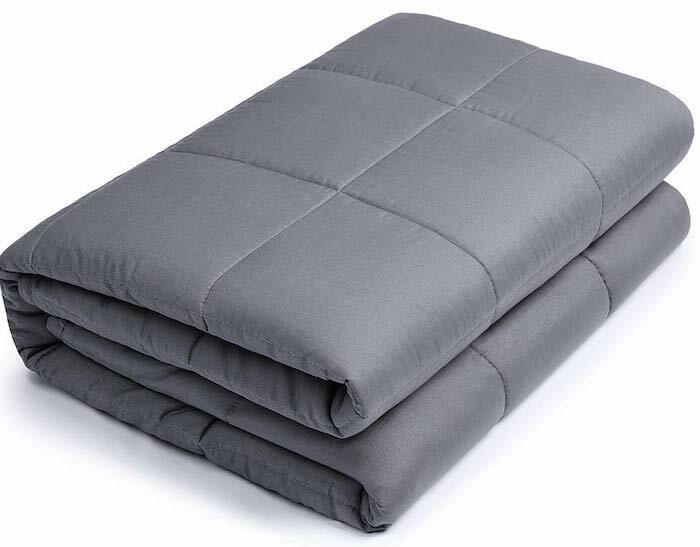 Generally speaking, the higher the quality of the weighted blanket the costlier it will be, but this is also linked to the manufacturer. Your bodyweight determines the blanket weight that you choose. Most people feel the most restful with a blanket that is 10% of their total body weight. It isn’t going to be for everyone as we all have different preferences. You also need to take any potential weight loss or gain into account because this can affect the weighted blankets that right for you. Weighted blankets come in a range of colours and patterns. Some people will be very particular about the colour as they may want it to fit in with the rest of their bedding or interior whereas it won’t be an issue for others. Weighted blankets come in a range of weights so they won’t all be right for you. Some may be too light, and some may be too heavy to be comfortable. To be able to find the most suitable blanket you may need to try several different options. Many companies offer a trial period that allows you to test out the product before making a final decision. It’s important to check whether your desired blankets seller provides this. A warranty will often give you a better idea of the quality of the product. A manufacturer who believes in the quality of the product will almost always offer a warranty of some sort. It gives you the added security and peace of mind that if something does go wrong with the product that they’ll be there to assist you. Warranties can range anywhere from 12 months to lifetime and will vary depending on the manufacturer. Not all weighted blankets can be machine washed and depending on the material it may need to be dry cleaned. 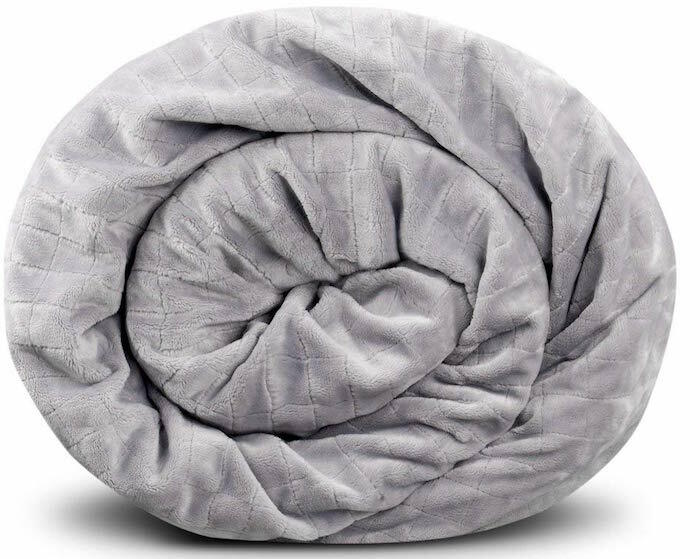 For the weighted blankets that can be machine washed you definitely can’t mix them. You should also avoid tumble drying and let them air out naturally, so they don’t lose there shape or bunch. Another absolute no is using chlorine bleach because this will breakdown the fibres within the blanket fabric while fabric softeners can make the blanket feel rough. What weight blanket should you buy? Weight is one of the most important factors to consider when making a final purchasing decision. This will come down to personal preference because some will prefer a greater grounding weight feeling whereas others will opt for a lighter feel. Here are the recommended weights by age range. It’s best to start in these ranges and then adjust from there. 0-7 years: Weighted blankets aren’t recommended for this age group without consulting with a medical professional. If this has been approved, then an ideal starting point is by calculating 10% of their body weight. 8-12 years – A medium-sized weighted blanket is recommended for children of this age. Simply find 10% of their current body weight and then add 2 pounds to find their suitable weight blanket size. Teenagers & Adults -For those 13 years and above, a larger sized weighted blanket will be the most effective. Just find 10% of the user’s body weight and add 3 pounds to find the right weight of the blanket. Luckily the best-weighted blankets often quote the weight range and age that they are most suitable for, so you’ll usually not have to make these calculations. How Effective are Weighted Blankets? Throughout the years there has been an increasing number of studies carried out to investigate whether the claimed effects are true. In 2015 a study published in the Journal of Sleep Medicine and Disorders featured 31 subjects who were adults who have chronic insomnia. The participant's sleep was tracked over one week using their normal bedding. During the following two weeks they then switched to a weighted blanket. Following this, they then reverted to their original bedding. The results from the study concluded that four out five (80%) of participants preferred to use the weighted blanket and slept for longer while also to spend less time awake after being disturbed with the results being confirmed by the sleep testing. The subjects also reported that they found it easier for them to settle into sleep when using a weighted blanket plus to feel more refreshed the following morning. Another study in 2011 investigated the effect that using a weighted blanket has on sleep. The study involved 42 children aged between 8 and 13 years who also had ADHD. Each child’s sleep was tracked using sleep technology, and parents completed diaries for four weeks. The results from the study showed that the children with ADHD who used a weighted blanket reduced their sleep latency and disturbances down to the levels that are usually seen in children who don’t have ADHD. Lastly, a study in 2006 set out to discover the effectiveness of a 30lb weighted blanket on their sleep. This involved 32 adults and the results gained from the study revealed that 63% of participants reported lower anxiety and 78% preferred using the weighted blanket as a method of calming. Although the study featured a limited number of participants, it presents a Launchpad for further study into the area.